Along with your case you will also be able to securely display a 8.5 inch x 11 inch document in the document holder. and the back board is covered in rich, luxurious black felt. 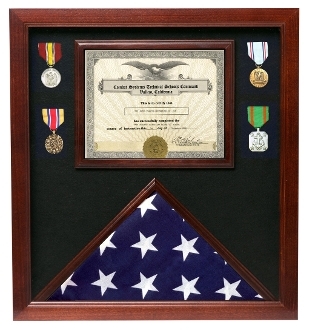 This particular display case is one of the best memorial flag frames on the market. Crafted from solid wood and not cheap MDF materials, You can choose from three styles and the oak units in particular offer an exceptional finish along the cherries and the black. You can purchase the display with or without the matching pedestals and a stand can be purchased separately. This particular model has a rear and a front opening area which is hinged with a magnetic clasp that is cherry colored. Craftsmanship: The solid wood construction, plexiglass window and overall craftsmanship put into the flag frames are second to none in our industry. There are a number of reasons why our services will work for your needs. Our flag frames are perfect to commemorate a veteran who has served their country. The 5’ x 9 ½’ case is perfect for burial flags while the 3’ x 5’ veteran flag case is usually displayed outside the home. In addition, the smaller size frames are well suited for displaying an ensign in offices or dens. The cases themselves are crafted with high quality materials and can be passed down to future generations to preserve the memory of an American hero. We offer solid wood flag frames, military display cases and tabletop or freestanding cases in various shapes and sizes. We also sell acrylic displays for sports memorabilia, standard cabinets for displaying trophies and various items and wall mounted cabinets are available as well. Orders for the Flag medal display case, Great flag case for retirement ceremony are usually shipped out within one business day to places within the USA and Canada.